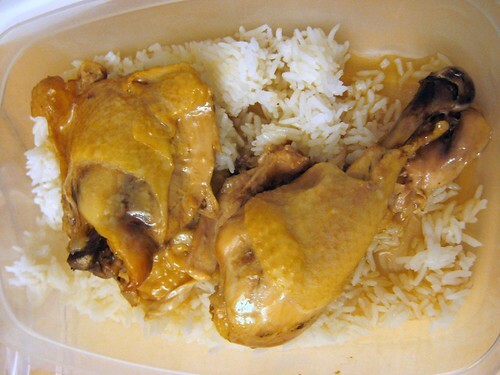 Adobong Manok (Chicken Adobo) | Hapa...Shot the Food! ← *Do* Try This at Home! Conisdered in many respects to be the national dish of the Philippines, Adobo is the quintessential Filipino comfort food. It’s a simple dish consisting of something (often meat, but sometimes vegetables — sometimes both) cooked with vinegar, soy sauce, garlic, bay leaves, and peppercorns. 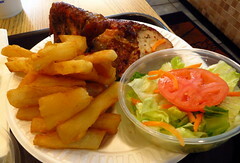 It differs from its counterpart in Latin American/Southwestern cooking in a few ways: Tomatoes and chilles are often not found in the Filipino version, and Filipino Adobo is more akin to a stew than a meat rub. Combine all ingredients in a large pot. Cover and marinate chicken for 1-3 hours. Bring to boil, then lower heat. Cover and let simmer for 30 minutes, stirring occasionally. Uncover and simmer until sauce is reduced and thickened, and chicken is tender, about 20 more minutes. Serve with steamed rice. 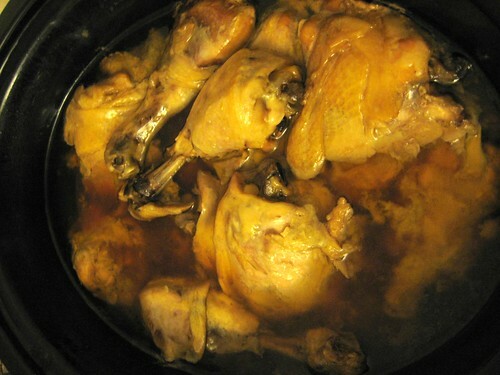 I’ve also been known to use the same recipe in the crock pot, as the meat ends up being fall-off-the-bone tender (that and I can forget about watching the pot! ;)). One drawback to the crock pot method is that the adobo flavor is initially weak compared to the method outlined in Domingo’s Recipe (and even then I don’t serve the stovetop version until the next day). However, like any good abobo, it improves with age, and thanks a heavy vinegar content, it keeps pretty well, too. 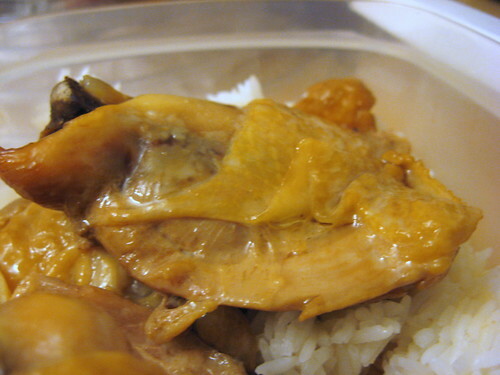 Posted on May 19, 2008, in comfort food, entrees, Filipino, recipe, Uncategorized and tagged chicken, crock pot. Bookmark the permalink. 8 Comments. I’ve yet to try one with coconut milk (as popular in the Southern Philippines), for example, as my Mom’s family is from Pamapanga. Pingback: Sabine = Lemming « Sabine…Shot the Food! Pingback: Hey… It’s How My Mom Rolls (Lumpia)… « Sabine…Shot the Food! Pingback: Adobong Gulay « Sabine…Shot the Food! Pingback: Sinangag (aka Garlic Fried Rice)… « Sabine…Shot the Food! 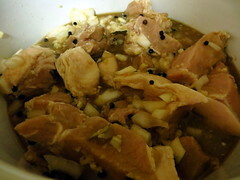 Pingback: Adobong Baboy (Pork Adobo) « Librarian…Shot the Food!